Portland returns to AOWR after an 11 year hiatus, having previously been part of the CART/Champ Car schedule from 1984-2007. Portland International Raceway is part of the Delta Park complex, on the former site of Vanport, just south of the Columbia River. The venue hosts ICSCC, SCCA and OMRRA road racing as well as the NASCAR K&N Pro Series West and SCCA autocross events. The city of Vanport was hastily built by Henry Kaiser in 1942, to house World War II shipyard workers. Buildings went up quickly and soon Vanport had a population of more than 40,000, making it the the second largest city in the state of Oregon at that time and the largest public housing project in the nation. The city lay between the contemporary Portland city limits and the Columbia River, on reclaimed lowlands. Vanport was protected by a system of dykes which held the waters back. Tragically, after weeks of heavy rain, the dykes failed at 4.17pm on Memorial Day, May 30, 1948. A 10-feet high wall of water rushed in killing 15 people and within half an hour the entire city was flooded. When the waters eventually receded, all the buildings were destroyed, with no prospect of the remainder being habitable. After the debris was cleared away, the city was abandoned. In 1960, the city of Portland bought the land from the Army Corps of Engineers for $175,000. Racing enthusiasts saw the potential of the land and the Portland Rose Festival Association was persuaded to sponsor a race and so the Rose Cup was born, with its first running in June 1961. The race has been an important part of the Rose Festival ever since. However, racing on the old city streets was dangerous, with drivers leaving the track unexpectedly or colliding with leftover concrete foundations or even finding themselves driving into ponds! Under threat of losing the Rose Cup races, as many of the sanctioning bodies refused to back races due to the deteriorating roads, the track was finally paved in the 1970s. Funded by a $100,000 loan arranged by the Rose Festival Association from four banks, all of the monies were paid back by 1973 and the facility has operated as a commercial enterprise ever since, generating a profit for the City of Portland and meaning it requires zero funding by the taxpayer. In 1975, the track changed its name from West Delta Park, to Portland International Raceway and hosted the third round of the Trans-Am Series, the premier series of the Sports Car Club of America, which was won by John Greenwood, driving a Chevrolet Corvette, who went on to win the championship that year. On June 17, 1984, Portland hosted the fifth round of the CART PPG/IndyCar series, Stroh's 200 Miles, though for nearly its entire existence, the title sponsor of the race was G.I. Joe's sporting goods and auto parts store. It was won by Al Unser, Jr, in a March 84C-Cosworth DFX, driving for Galles Racing. The race became a perennial on the calendar, up until the last race as a Champ Car event on June 10, 2007, which was won by Sébastien Bourdais, in a Panoz DP-01-Cosworth XFE driving for Newman/Haas/Lannigan Racing. The race ws notable for two things. It the first standing start in Champ Car history, with all 17 cars getting away from the grid and there were caution flags. Like many tracks on the IndyCar calendar, Portland has undergone a number of changes. In 1984, prior to hosting the fifth round of the CART/PPG IndyCar series, the track underwent some $800,000 worth of improvements. Most noticeably was to the track itself, with the addition of a chicane, known as the 'Festival Curves', toward the end of the main straight, while a permanent pit lane and paved paddock area was installed for the first time on the infield. Elsewhere, Victory Boulevard was widened and concrete barriers and fencing were installed along the inside of its entire length. The final turn was also repaved and widened near the new pit entry road. The entire front straight, Vanport's Cottonwood Street, was also repaved. 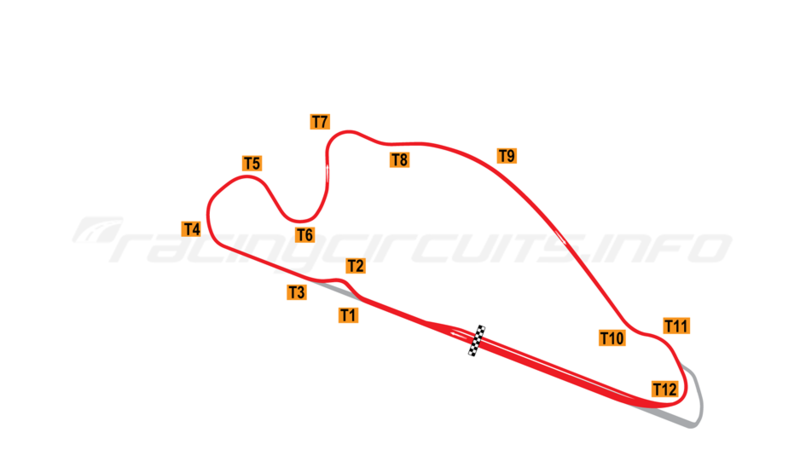 The changes increased the track length to 1.967 miles (3.165 km). By 1992, the speed of the CART race cars need to be slowed and the Festival Curves were reconfigured into a much tighter chicane and paved in concrete. The Festival Curves were again modified for the 2005 season, with the second turn widened and made faster to try and alleviate the traditional first lap pile-up. In 2008 PIR went through a further track renovation, with a complete resurfacing with new asphalt and the reconfiguration of Turns 4 to 7. The fence on the inside of turn 6 was moved to provide a better sight-line, while Turn 7 was sharpened, to slow cars down prior to entering the back straight. FIA-specification curbing was also installed around the track which opened in its new form on February 23, 2008, with a ribbon cutting ceremony. This year's race will be held in September on Labor Day weekend, promoted by Green Savoree Racing Promotions. Of the current crop of drivers, only five have previously raced at Portland. Scott Dixon and Tony Kanaan: 2002 G.I. Joe's 200. Ryan Hunter-Reay: 2005 G.I. Joe's Champ Car Grand Prix of Portland. Graham Rahal and Sébastien Bourdais: 2007 Mazda Champ Car Grand Prix of Portland. RSPORTS, Panoz DP-01-Cosworth XFE. Champ Car World Series. Last edited by bjohnsonsmith; 29 Aug 2018 at 18:54. Looking forward to this one but I'll likely have to catch the replay as I'm actually going somewhere for a holiday for the first time in a long time. And thanks again for yet another excellent intro/background post. Great to see the return to a nice venue. None of my cars ever had a decent finish there but I can't hold that against the track. Hoping for a good crowd. Interesting to see Marco fastest of the Andretti entries after two sessions at Portland. 4th overall behind Dixon (P1), Power, and Newgarden. Veach P5, RHR P7, Rossi P9. Harvey (P10) and King (P11) also going well. Hoping for an underdog to land on the podium, don't really care who. Thanks. Bourdais tops P1. Exactly half the field under Wilson's 2007 pole time. Session red flagged at 24 minutes. Sato head on into the tire barrier. Last edited by mstets; 31 Aug 2018 at 22:01. Another red flag at 42 minutes for Pagenaud head on into the same T11 tire barrier. Ferrucci topping the times at 57.4818. He was the first out on the alternate tires. Bourdais says he didn't get a clear lap on the red tires in P2, so perhaps he can shine in qualifying. Also note that the official track record is Justin Wilson's, a lap of 57.597 seconds set in qualifying in 2005. Air temp and amount of sunlight may be key to qualifying. There seemed to be less grip in the second session on Friday due to temps, which were really not all that high. Will Power took Pole, having broken the lap record in the first round of qualifying, with a time of 57.2143 seconds. Power now has the second most pole positions in the history of Indycar with 53, moving him clear of AJ Foyt but Mario Andretti still leads with 67. Newgarden completed a Penske front row shut out. The other Championship contender Rossi, is 3rd. didn't get to see this as espn put bloody tennis on both channels. looks like it was a very dramatic race. I watched some of it, a lot of people will find it entertaining but to me that was just a complete mess. Not much to do with racing in my opinion.